Press any key to vent radiological emission into atmosphere. Portal 2 differs from its predecessor in a few important areas. 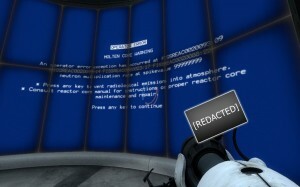 The narrative is more complex, providing much of the backstory for Aperture Science and some of its key players. Where Portal's test chambers became more difficult and deadly as you progressed, Portal 2 has more variety, introducing mechanics throughout the course of the game. Finally, single-player replayability is very limited, as they seemingly replaced the single-player challenges with a multiplayer co-op mode. I completed Portal 2 in 8.3 hours, by Steam's reckoning. The dialog sucked me in and did not let go. I found myself eagerly awaiting the next interaction point, sometimes standing still in a single place or performing an action contrary to the objective to elicit a response from one of the actors. The environmental attention to detail spans from haunting to hilarious. Do yourself a favor and take time to look around. I've given only minimal attention to the multiplayer mode (two full sets of test chambers complete) but the initial experience was mind-bending. Four portals takes some getting used to. Add to that the complexity of synchronizing actions with a remote partner. Portal was good, but I'm well and truly hooked after Portal 2. Thanks, Valve.